Report 'GREAT PAID OPPORTUNITY FOR BACKPACKERS IN LATIN AMERICA'? Selina Hostels, a hostel chain in Central America, (Selina Hostels in Panama) is looking for backpackers to help our Market Research team, investigating about cities, tours, hostels and writing reports. If you are travelling for the next months, speak English and Spanish and would like to earn extra $$ for your trip, please, send us an e-mail to work@selinahostels.com with the title "Backpacker Researcher", explaining about your current trip status, the next countries you will visit and a brief of your background, previous experiences and skills. 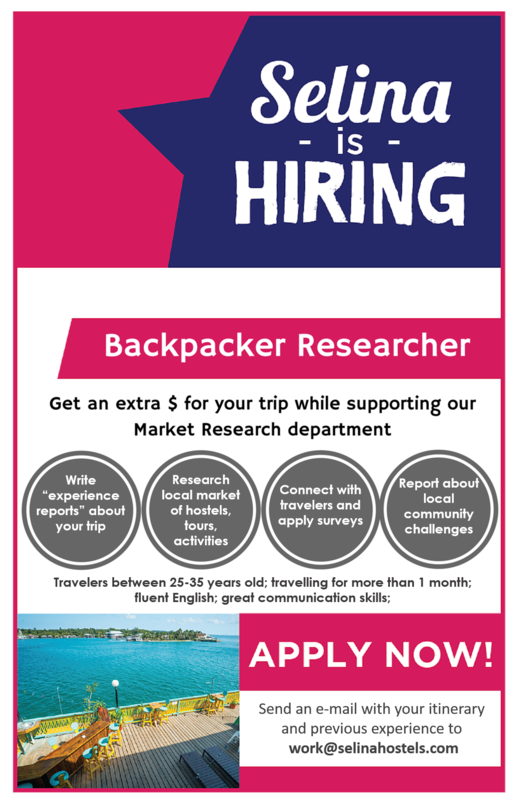 The Selina Hostels chain (Selina Hostels in Panama) is looking for backpackers to help our Market Research team, investigating about cities, tours, hostels and writing reports. If you are travelling for the next months, speaks English and Spanish and would like to earn an extra $$ for your trip, please, send us an e-mail to work@selinahostels.com with the title "Backpacker Researcher", explaining about your current trip status, the next countries you will visit and a brief of your background, previous experiences and skills.